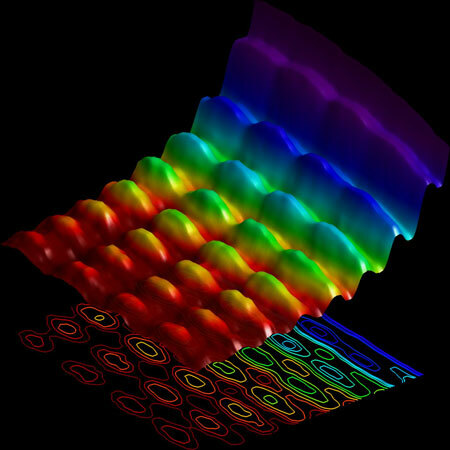 (Nanowerk News) Quantum mechanics tells us that light can behave simultaneously as a particle or a wave. However, there has never been an experiment able to capture both natures of light at the same time; the closest we have come is seeing either wave or particle, but always at different times. Taking a radically different experimental approach, EPFL scientists have now been able to take the first ever snapshot of light behaving both as a wave and as a stream of particles. The breakthrough work is published in Nature Communications ("Simultaneous observation of the quantization and the interference pattern of a plasmonic near-field"). When UV light hits a metal surface, it causes an emission of electrons. Albert Einstein explained this "photoelectric" effect by proposing that light - thought to only be a wave - is also a stream of particles. Even though a variety of experiments have successfully observed both the particle- and wave-like behaviors of light, they have never been able to observe both at the same time. "This experiment demonstrates that, for the first time ever, we can film quantum mechanics - and its paradoxical nature - directly," says Fabrizio Carbone. In addition, the importance of this pioneering work can extend beyond fundamental science and to future technologies. As Carbone explains: "Being able to image and control quantum phenomena at the nanometer scale like this opens up a new route towards quantum computing."